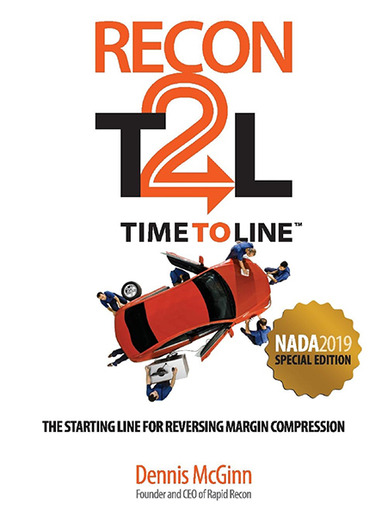 PALO ALTO, Calif. — Rapid Recon announced today the release of “RECON T2L, the Starting Line for Reversing Margin Compression,” a new reconditioning best practices guidebook written by company founder and CEO Dennis McGinn. The book is available free to dealers attending NADA Show 2019 this month in San Francisco. Readers will be encouraged to evaluate their existing reconditioning practices based on real-world case studies. The text includes ample financial analysis, in tables and charts, to help dealers compare their current recon practice output to output driven by “time-to-line” (or “T2L”) principles, McGinn said. Visit Rapid Recon at Booth 6653W at NADA Show 2019.